WASHINGTON, DC and ARMONK, NY -- (MARKET WIRE) -- November 15, 2005 -- President George W. Bush announced today that IBM has been awarded the 2004 National Medal of Technology by the U.S. Department of Commerce and the Technology Administration in recognition of more than four decades of innovation in semiconductor technology. The award recognizes IBM advances that have improved the performance and versatility of today's microprocessors, citing significant breakthroughs such as the development of multicore-processor integration, DRAM (Dynamic Random Access Memory), the use of copper on-chip wiring, Silicon on Insulator (SOI) technology, and high-speed Silicon Germanium chips. The National Medal of Technology is the highest honor awarded by the President of the United States to America's leading innovators. It recognizes companies and individuals who have made lasting contributions to America's competitiveness, standard of living, and quality of life through technological innovation, and substantial contributions to strengthening the nation's technological workforce. "At IBM, we understand that the true value of innovation comes not from the invention but rather the application of new technology to benefit business and society," said Nick Donofrio, executive vice president, innovation and technology. "Our four decades of breakthroughs in semiconductors have made possible many new products and services that greatly enhance the quality of our lives and our ability to conduct business more efficiently and productively. We're honored to be recognized for our long-term commitment to basic research and development -- and more motivated than ever to extend the limits of what is possible in the future." IBM is recognized as a global leader in the development and manufacturing of state-of-the-art semiconductor and interconnect technologies, including the company's industry-leading Power Architecture microprocessors. IBM semiconductor technology is the heartbeat of digital devices large and small, from cameras and mobile phones, to the world's most powerful supercomputers. IBM is dedicated to the concept of 'collaborative innovation,' and is engaged in joint development projects with the world's leading semiconductor developers to advance the science of nanotechnology. In East Fishkill and Albany, New York; Burlington, Vermont; Austin, Texas; Rochester, Minnesota; San Jose, California; and other locations, IBM is working side by side with the world's technology leaders. Copper conductors -- Copper conducts electricity 40 percent more efficiently than aluminum. IBM researchers pioneered the use of tungsten to create copper-based chips capable of running significantly faster than aluminum-based technology. Silicon-germanium (SiGe) -- Used in bipolar chipmaking in place of the more expensive gallium arsenide process, SiGe allows for significant improvements in operating frequency, current, noise, and power capabilities, particularly for today's mobile wireless devices. Silicon on insulator (SOI) -- Placing a thin layer of insulation between the silicon surface and the transistors protects the transistors from electrical effects, resulting in improved performance and lower power consumption. Strained silicon -- This technique strains (or stretches) silicon, thus speeding the flow of electrons through a chip, increasing performance and lowering power consumption without any miniaturization. When coupled with SOI, the use of strained silicon speeds performance and further decreases power consumption. Chemically amplified photoresists -- This innovation uses clever light-sensitive chemistry to enable ever-smaller circuit features to be transferred to the silicon wafer and reliably manufactured. Established by an act of Congress in 1980, the Medal of Technology was first awarded in 1985. By highlighting the national importance of technological innovation, the Medal also seeks to inspire future generations of Americans to prepare for and pursue technical careers to keep America at the forefront of global technology and economic leadership. IBM last received the Medal of Technology in 2000 for innovation in the technology of hard-disk drives and information storage products. IBM semiconductors are a major contributor to the company's position as the world's largest information technology company. Its chip products and solutions power IBM eServer and TotalStorage systems as well as many of the world's best-known electronics brands. 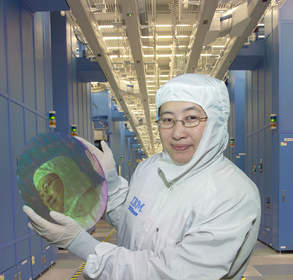 IBM Vice President Lisa Su with a Cell microprocessor <br>wafer at the company's fab in East Fishkill, NY. <br> President George W. Bush today announced IBM as a<br> National Medal of Technology winner for chip <br>breakthroughs.